Sariska Wildlife Sanctuary covers an area of 800 sq km in total, with a core area of approximately 500 sq km. The Northern Aravali Hills dominate the skyline with their mixture of sharp cliffs and long narrow valleys. The area was declared a sanctuary in 1955 and became a National Park in 1979. The landscape of Sariska comprises of hills and narrow valleys of the Aravali hill range. The topography of Sariska supports scrub-thorn arid forests, dry deciduous forests, rocks and grasses. The broad range of wildlife here is a wonderful example of ecological adoption and tolerance, for the climate here is variable as well as erratic. It is located in the contemporary Alwar district and is the legacy of the Maharajas of Alwar. Pavilions and Temples within Sariska are ruins that hint at past riches and glory. The nearby Kankwadi Fort has a long and turbulent history. In morning and evening, wildlife in Sariska heads towards the many water holes, which litter the park, thus providing the guests with their best chance of viewing game. At some of these watering holes it is possible to book hides which are situated in prime spots for wildlife viewing. The park is home to numerous carnivores including Leopard, Wild Dog, Jungle Cat, Civets Hyena, Jackal, and Tiger. These feed on species such as Sambar, Chital, Nilgai, Chausingha, Wild Boar and Langur. 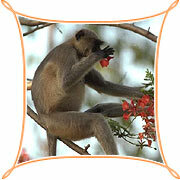 Sariska is also well known for its large population of Rhesus Monkeys, which are found around Talvriksh. The avian world is also well represented with Peafowl, Grey Partridge, Bush Quail, Sand Grouse, Tree Pie, Golden backed Woodpecker, crested Serpent Eagle and The Great Indian horned Owl.